Beth and I did a day trip to visit some historic places south of Tucson. We started in Tubac, the oldest European settlement in Arizona. Spaniards established a garrison here in 1752 to protect settlers and peaceful Pima and O'odham Indians from Apache raids. This school, built in 1885, was one of the earliest in Arizona. It was in use until 1965. Had this childhood song in my head all day after seeing the lyrics on the chalkboard. Stairs leading underground led to this display of the original foundation of the Presidio, exposed during an archaeological dig. The Spanish mined this area for copper, gold, and silver. This arrastra is a primitive system that was used for crushing ore. The heavy flat-bottomed boulders, attached to chains were dragged over the ore by oxen or mules. In the museum we learn about an early Tubac Barrio home that has been preserved here. Generations of the Rojas family lived in this 4-room Mexican adobe row house, built in the 1890s. It was occupied until 1989 when the last of the Rojas died. Today, Tubac has become an arts and crafts center with more than 50 studios and galleries. We walked around admiring the colorful art. A whimsical sculpture garden was a lot of fun. Another historic building in Tubac...the Customs House. 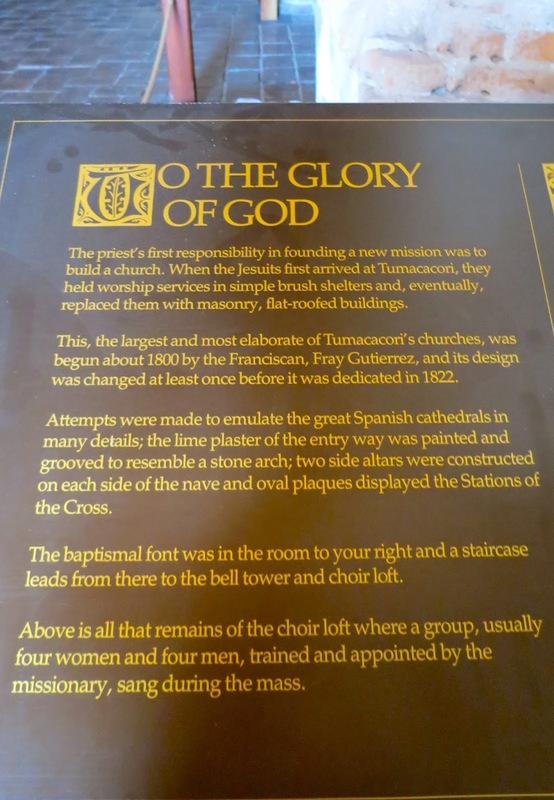 We also visited the mission church at Tumacacori National Historic Park. The mission church was built by the Franciscans around 1800. It was abandoned in 1848 because of Indian uprisings. Shortly after the church was abandoned, the roof was removed by settlers to use the wood for other construction. It was replaced in 1921, but the nave was exposed to the elements for over 60 years, resulting in extensive damage. What the inside originally looked like. You can see some of the original painting in this area. The bell tower is not damaged...it was never finished when the church was abandoned. The bells are not the original. In the park, this woman was demonstrating making corn tortillas....and giving out samples. Really good. You have seen some very interesting places.